Mr. Prakash Singh’s monograph on the Maoist Movement in India benefits from his unique perspective as a distinguished police officer in some of the country’s most turbulent regions. He provides a detailed history of insurgency in India, including the history of uprisings starting from the Telengana insurrection of the mid-to-late 1940s to the Communist move¬ment, sponsored by Mao Zedong’s China. Mr. Singh traces the transition of the peasant-led Naxalite movement, with its roots in a single village in West Bengal, to the Communist Party of India (Maoist) Movement, which has spread to some 20 of India’s 28 states. India’s prime minister has declared more than once that the Maoist challenge is the biggest threat to the internal security of the country. How India accommodates its tribal minorities and reaches an accommodation with insurgents is a critical element for long-term regional stability. Since the 1979 Islamic Revolution, Iran has perhaps been the United States’ most intractable foreign policy issue. Dr. Roby Barrett provides a deep analysis of Iran’s motivations and finds that they are not the result of irrational messianic religious thought, but rather are based on a rational worldview developed over centuries of history. Looking back over the course of history Barrett argues that a strong sense of victimization and humiliation, rooted in Persia’s loss of its historical preeminence in the Gulf, shapes the Iranian psyche. He suggests that their president holds little actual power. The Iranian constitution vests the highest political and religious authority in the supreme leader; this includes the power to declare war and dismiss the president. As such the United States must be prepared to deal with the paradigm of an entire regime, not just the president. Retired Brazilian Army Major General Alvaro de Souza Pinheiro, in his monograph highlights the importance of knowing our partners. General Pinheiro begins by presenting a Brazilian point of view of the post-9/11 world. He then presents a history and over view of Brazilian SOF units from the Army, Navy, Marine Corps, and Air Force. Modern day Brazilian Army SOF pioneers attended U.S. Army schools and founded Brazil’s Special Operations Course in 1958, which later expanded to include Commando Actions, Special Forces, and Jungle Operations qualifications courses. In 2002 the Brazilian Special Operations Brigade was created by presidential decree. As U.S. Special Operations Command looks to thicken the global SOF network, General Pinhiero’s monograph is a must read for the American SOF operator in order to better know our partners. Each year, JSOU partners with the Special Operations and Low Intensity Conflict (SO/LIC) Chapter of the National Defense Industrial Association (NDIA) in sponsoring the annual chapter essay contest. The first-place winner is recognized each year at the NDIA SO/LIC Symposium held in the February and awarded a $1,000 cash prize. The runner-up receives a $500 prize. The competition is open to resident and nonresident students attending Professional Military Education (PME) institutions and has produced outstanding works on special operations issues. These essays provide current insights on what our PME students see as priority national security issues affecting special operations. JSOU is pleased to offer this selection of the top five essays from the 2012 contest. 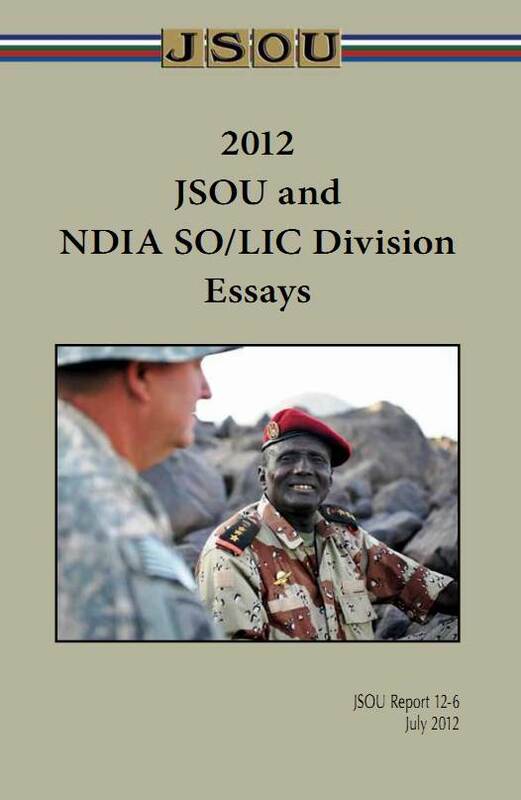 The JSOU intent is that this compendium will benefit the reader professionally and encourage future PME students to write on special operations issues. 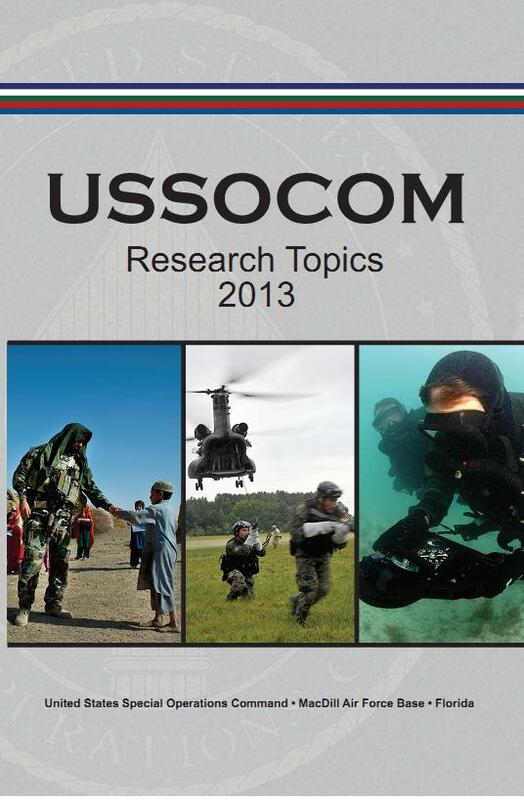 The USSOCOM Research Topics 2013 list represents an effort to identify, categorize, and list SOF-related research topics for research by PME students, JSOU Senior Fellows, and other SOF researchers who desire to make timely and meaningful contributions to SOF issues and challenges. Each year representatives from USSOCOM, the Theater Special Operations Commands (TSOCs), SOF chairs from the war colleges, and JSOU senior fellows develop a list of salient issues confronting SOF in the near term. The list is vetted through the components and TSOCs to ensure that research will advance SOF missions and support SOF interests. The final recommendations for research topics are approved by the USSOCOM commander. Ultimately, the research, study, and debate of these topics will inform decision makers and better prepare SOF for our current conflicts and future challenges. 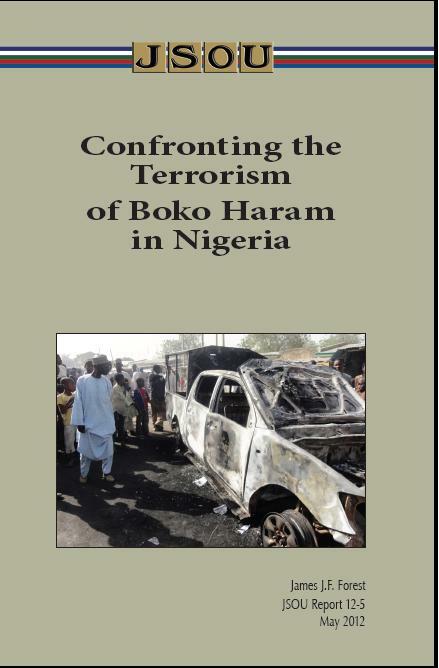 In this monograph counterterrorism expert James Forest assesses the threat Boko Haram poses to Nigeria and U.S. national security interests. As Dr. Forest notes, Boko Haram is largely a local phenomenon, though one with strategic implications, and must be understood and addressed within its local context and the long standing grievances that motivate terrorist activity. Dr. Forest deftly explores Nigeria’s ethnic fissures and the role of unequal distribution of power in fueling terrorism. Indeed, these conditions, combined with the ready availability of weapons, contribute to Nigeria’s other security challenges including militancy in the Niger Delta and organized crime around the economic center of the country, Lagos. 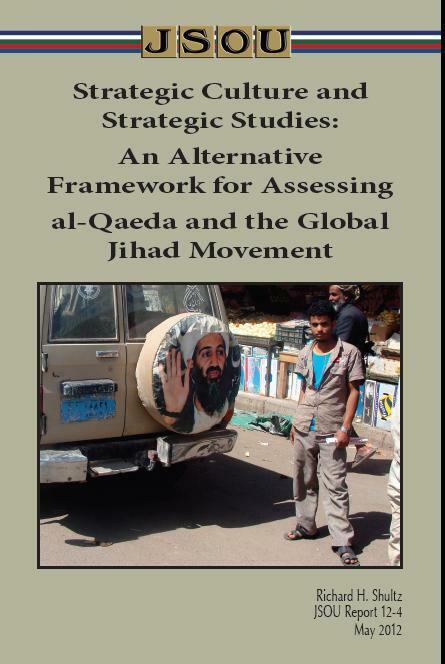 More than a decade after the September 11, 2001 terrorist attacks on the United States by al-Qaeda and a year after the death of Osama bin Laden, Dr. Richard Shultz offers an innovative analysis of that organiza-tion’s strategic culture. His analysis upends the conventional wisdom that only nation-states can have a strategic culture, an internal process through which issues of strategic significance and intent are discussed, debated, refined, and executed. Lieutenant Colonel Derek Jones wrote this School of Advanced Military Studies award-winning comprehensive study of clandestine cellular networks and the effect on counterinsurgency operations in 2008 while a student at the School of Advanced Military Studies, Fort Leavenworth, Kansas. Consequently, his monograph, although timeless in its discussion and analysis of clandestine cellular networks, was drafted years before the May 2011 operation against Osama bin Laden that resulted in his death. Therefore, the paper does not address the impact on such organizations from the death of its most charismatic leader. His monograph does provide, however, a theoretical, doctrinal, and operational understanding of the form, function, and logic of clandestine cellular networks resulting in valuable insight and understanding of the complex nature of these organizations. Colonel Bernd Horn’s monograph on the legacy of Canadian Special Operations Forces (SOF) highlights the colorful history and heritage of SOF from a vital partner nation. Horn reaches back to the 17th and 18th centuries with the Canadian Ranger tradition. He recounts Canada’s entry into World War II and its SOF experience with the British-led Special Operations Executive. He highlights a combined U.S./Canadian unit, the First Special Service Force, which trained together in Montana and fought alongside each other earning the moniker “Black Devils” by the Germans. Colonel Horn then continues to present day. He provides a brief but exciting recap of Canadian SOF history that not only enriches our understanding of SOF from a key ally, but also highlights the historic bonds and military experiences that our two great nations share. Dr. Henriksen argues that America needs to get back to the basics of counterinsurgency lest it bankrupts itself in nation-building and reconstruction projects that are driven from the top, not the bottom. Citing tremendously expensive “Winning Hearts and Minds” efforts in Iraq and Afghanistan, he hypothesizes that “WHAM operations must be waged with much less expenditure of U.S. dollars in the years ahead.” He offers Britain’s frugal victory in Malaya as one example of a low budget counterinsurgency success that started with protecting the people, over time formed a representative government, and linked the people and their support to that government. Economic development was part of the strategy, but it was a supporting and complementary effort. It wasn't a major effort in and of itself.